The Tesla Radio Conspiracy: Remote Control: In 1893! 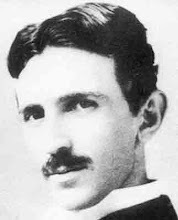 The first demonstration of an apparatus for radio transmission and reception was conducted by Tesla in 1893 during a presentation in St. Louis before the National Electric Light Association. 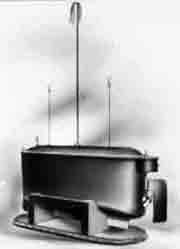 The small radio-controlled boat in the picture (Tesla called it a telautomaton; note the antennas) was first demonstrated to the public in 1898 at New York City's old Madison Square Garden. A patent with the long title "Method of and Apparatus for Controlling Mechanism of Moving Vessels or Vehicles" (No. 613,809) was granted to Tesla in the same year. Tesla's two radio-controlled boats were built in the 1897-98 period. While they could withstand submersion, they had a slight positive buoyancy and no diving planes, and thus were not true submarines, as they are sometimes described. These boats were actually surface running torpedoes. The patent shows a detonator in the forward compartment. They can be considered as the direct predecessor of guided missiles developed during World War 2 by the United States, Germany and Japan, and present day precision guided weapons. Remote control photo reconnaissance drones, remotely operated vehicles (ROVs) that are used in hazardous environments, and planetary exploration vehicles such as the Mars rovers Sojourner, Spirit and Opportunity all trace their lineage back to these two devices.